Big or small we can transport any van or car up to a maximum weight of 2300kgs with our tilt bed trailers and 4×4 vehicles. Fully insured, we pride ourselves in our professional approach to dedicated vehicle car transport in both Northern Ireland and the Republic of Ireland. An ideal solution for private individuals and the motor trade. So you have purchased a car that is not fully road legal due to tax, mot/psv or insurance reasons. 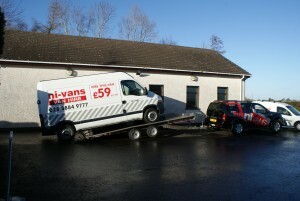 Who do you call, NI Vans are here to assist your vehicle’s logistics movements. What does it cost to use our car transport delivery service? Not as much as you think. We price all our jobs on a round trip basis working on the following pricing structure.